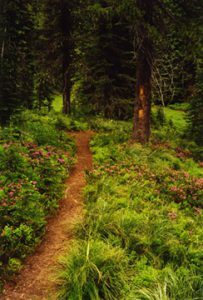 In 1986 the U.S Congress added the Nez Perce (Nimiipuu or Nee-Me-Poo) National Historic Trail to the United States’ National Trails System. Stretching from the Wallowas in Oregon, through North Central Idaho and a corner of Yellowstone National Park in Wyoming, and to the Bear Paws of Montana, the trail traces the flight of the Nimiipuu from their homeland during the 1877 Nez Perce War. Parts of the trail, including its route through the Clearwater Basin and across the Bitterroot Mountains, had been used since time immemorial by the Nimiipuu to reach the buffalo hunting plains of Montana. The (Lolo) trail is one of the most significant historical highlights of Clearwater country. The trail’s footpath and the pristine wild places through which it runs sustain ancient memory and nourish the spirit of all people. The trail’s historical value cannot be overstated. Preservation of the trail, the many Nez Perce War sites situated along the route, and the natural places it traverses, is of paramount importance. Learn about the grassroots efforts of Nimiipuu Protecting the Environment.